Your car's performance exhaust system needs to be working correctly to keep your car in top operating condition. Performance exhaust systems, whether they are aftermarket exhaust systems, custom exhaust systems or stock systems, help your vehicle in a variety of different ways. The exhaust system creates a more enjoyable driving experience by quieting the engine noise. It also reduces air pollution by controlling the emissions your vehicle releases. Having a properly operating catalytic converter is crucial to ensure that the exhaust system does not have leaks. Visit your local Meineke #2122 in Shelby Township, MI, today for more information about maintaining high-performance exhaust systems. Exhaust systems experience a lot of wear and can develop leaks and cracks. 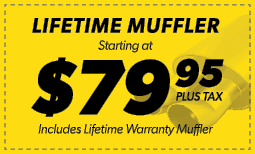 Keeping track of the state of your muffler is important to your car's function and your safety. If you want your car to run smoothly and protect you from carbon monoxide poisoning, check on your car muffler. If your average miles per gallon are going down, the car is sounding louder, or a bad odor is coming from the car, you should stop by a muffler shop to get it repaired or have it replaced with a performance exhaust system. We'll perform all inspections, maintenance, and replacements needed at Meineke #2122 in Shelby Township, MI. A common question we receive at Meineke #2122 in Shelby Township, MI, is whether fuel efficiency is really affected by the exhaust system. The answer is yes. Your exhaust system should include an oxygen sensor. This sensor is designed to detect the amount of oxygen that is coming through the entire exhaust system. It sends a signal to your engine to either increase or decrease the amount of fuel it burns to maintain maximum efficiency. However, if the oxygen sensor is defective, it can cause your vehicle to expend unnecessary fuel. Having your oxygen sensor changed every 60,000 miles can help eliminate this issue before it begins. Exhaust systems do eventually wear out. The combustion process inside of your engine creates a tremendous amount of heat. This forces chemical changes to occur. While much of your fuel is burned up, one of the remaining byproducts is water vapor. This vapor comes into contact with the metals causing oxidation and rust. Eventually the metals of your manifold, pipes, and car muffler wear out. They develop cracks and weak spots. You may hear loud engine noises or notice an odor as you drive. Fixing the problem may require an aftermarket exhaust or even a custom exhaust system to be installed. If you are experiencing any of these warning signs, contact our in Shelby Township MI, and have your vehicle inspected. When choosing a muffler shop you need to consider several things including location, your repair costs and the availability of custom exhaust systems. To keep your vehicle in great condition, it’s important for you to select a repair shop that has a reputation for high performance exhaust repairs and replacement. In Shelby Township, MI, the best way to keep your repair costs down is to bring your vehicle to Meineke #2122. Our experienced and certified technicians and our huge selection of performance exhaust systems for cars are the most affordable and practical solutions to all of your car repair needs. Make sure to visit us soon to get your vehicle ready for the road.